NDPL is a joint venture created in 2002 by Tata Power and the Government of NCT of Delhi as part of a privatization process. Also known as Tata Power Delhi Distribution Limited [TPDDL] , it is a joint venture between Tata Power and the Government of NCT of Delhi with the majority stake being held by Tata Power (51%). TPDDL distributes electricity in North & North West parts of Delhi and serves a populace of 6 million. NDPL Online Bill Payment facility is available to its consumers to easily pay the bills online with ease. The NDPL electricity Payment is also accepted offline but the online facility also good as company keeps giving gifts if you pay NDPL electricity payment by Credit card or Neft. Go to http://www.ndpl.com/ or http://www.tatapower-ddl.com/index.aspx to start the payment online. Click here to go and Pay now. 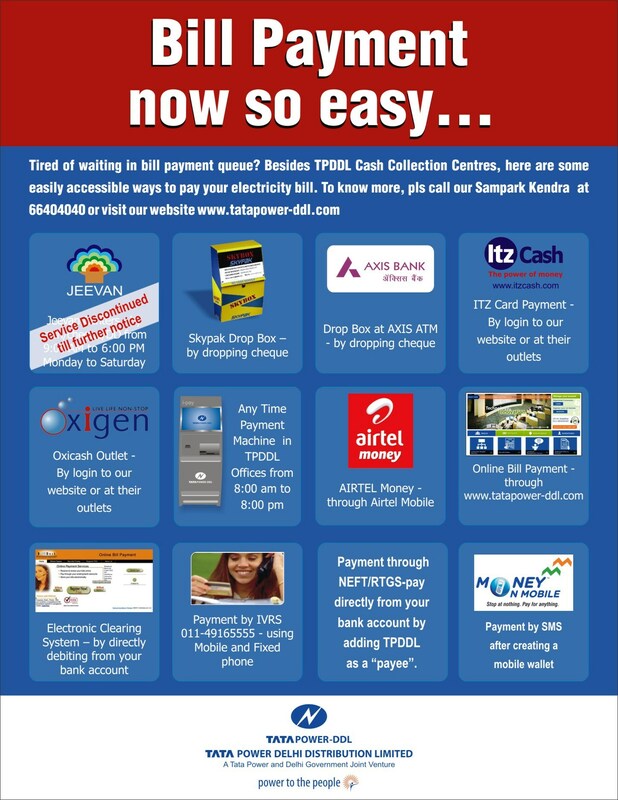 Select Bill Payment and then Click on Pay Bill Online .. Read More to start paying tpddl bill payment. Enter CA No, as shown in your Bill in the Space provided and click on Pay Now. You will be shown a warning pop-up for which you can click ok to proceed. NDPL Electricity Bill Payment CA no. You will be taken to the Pay Bill Online Account Details page where you can see the Amount outstanding and make the tpddl bill payment. You can make bill payment by credit card or net banking or Cash card or Airtel money. You will get few Pop-ups and Disclaimer on which you can click OK after reading. Take a printout or screenshot after making the payment as a proof. Do let us know if you face any difficulty in Bill payment using www.ndpl.com.